One of the most popular BBs out in the market, it's as close to a perfect 6.00mm as you can get. 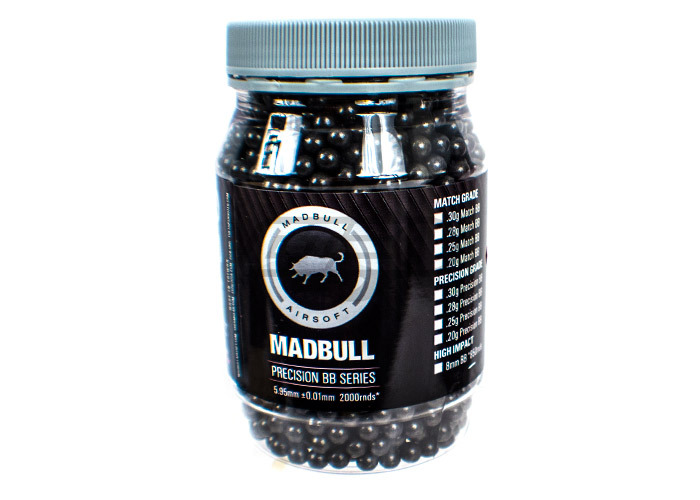 The Madbull 0.43g BBs come in bottles of 2000 rounds. Using a 0.43g BB will drop fps but increase the kinetic energy and overall accuracy, which is especially useful for outdoor play. Also, 0.43g BB are the perfect weight for use with sniper rifles. Mad bull has made a name for themselves with the quality of their wide range of airsoft parts and accessories. These Madbull BBs are constructed from ABS plastic and go through a multi-polish process to remove any imperfections. The precise craftsmanship of the 5.98 diameter make these BBs accurate without the jamming and smashing that can occur with lesser BBs. GI staff sold me these with my Echo1 M28 sniper rifle I just picked up in store. These BB's are awesome it is noticably more accurate than the .20g BBs I normally use. They fly straight, but the dark color makes it hard to set my hop up unless its a very sunny day. Luckily it isnt raining like it was last week. Let's get this out in the open first, false advertising by airsoftgi. These bb's are no different than any other bb in size as on the package itself it says 5.95mm not 5.98 as shown on airsoftgi.com. Anyways, still fantastic bb's. I use them in my Tanaka which granted, has some outstanding hop-up, but these are quite accurate. I have yet to see a flaw in one. My rifle is shooting 350 fps with. 2's so it has significantly lower power with these. However with the strong hop-up of the Tanaka I have outstanding range. I can hit fairly consistantly human sized targets at 85 yards. And at 100 yards the gas is too inconsistent to say i'm hitting consistent but not to say I can't. The accuracy here amazes me and I will continue to buy these. No biodegradable version of these.